This is a fantastic range of jewellery. The silver is very solid and sturdy. Earrings - pierced with butterfly backs. from The Jewellery Channel. Pendant with 18" chain. Cut: Square. British hallmarked. Complete with an 18" / 46cm 9ct yellow gold chain. A ll fittings are real 9ct gold (NOT plated, rolled or filled gold). A Classic pendant with earrings to match. This does not affect your statutory rights. VALENTINES PRICE CRASH £25.99 FROM £29.99! Stone 2 Type: Genuine Diamond. Stone Type: GENUINE DIAMOND. Cut: ROUND CUT. Stone Information. Stone 1 Type: Gemstone. Stone Size: 6mm. Stone Carat: 2.275. Earrings with Necklace. This set consists of a necklace and earrings. This can also be a wonderful treat for your-self. The Set has a plain, clean and elegant look, which would make the perfect gift for any seasonal and special occasion. Earring Information. Necklace Information. Stone Shape: Round. Tanzanite was discovered in 1967, word of the unearthing reached the celebrated New York Jewellers, Tiffany’s. Our jewellery is 100% Genuine and Hallmarked. There is no compromise in quality. This lovely piece is gift wrapped and sent in a jewellery presentation box. A stunning pendant and earring set. This does not affect your statutory rights. All fittings are solid Sterling Silver. These are a must have in any jewellery collection! Admired for their striking beauty and strength (and being a girl's best friend), diamonds are the precious stone emblematic of the greatest romantic gestures. Stone Shape: Round. Stone Size: 3.5mm | 2.5mm | 1.7mm. Stone Size: 4mm | 3mm. Necklace Information. Bracelet Information. Stone Shape: Round. Set in a Silver Cluster Ring. Total Silver Weight 13.4 Grams. Total Gem Weight 9.80 Carats. Total Silver Weight 2.8 Grams. Total Gem Weight 2.34 Carats. Total silver Weight 28.6 Grams. Total Gem Weight 11.34 Carats. Stone Shape: Round. Stone Size: 2mm. Stone Size: 2.5mm. Diamond Information Natural/Created: Natural Diamond. Birthstone: May | Zodiac: Cancer | Wedding Anniversaries: 20th & 35th. Natural/Created: Natural Mined Stone. 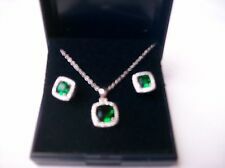 New listingH.Samuel New Emerald & Diamond Gold Necklace & Earrings set Quick SALE! Pendant and Earring set. Complete with 9ct gold 18" Prince of Wales chain. All fittings are real 9ct gold (NOT plated, rolled or filled gold). This does not affect your statutory rights. 20 x 7.5mm. Complete with an 18" / 46cm 9ct yellow gold chain. VALENTINES PRICE CRASH £19.99 FROM £22.00! Color: FOREST GREEN. Stone 2 Type: Genuine Diamond. Stone Type: GENUINE DIAMOND. Stone Information. ALL OUR GEMS ARE NATURAL AND GENUINE UNLESS OTHERWISE STATED. Complete with an 18" 9ct yellow gold curb chain. Earrings with Necklace. This set consists of a necklace and earrings. Chain length = 18” 45.72cm. The Set has a plain, clean and elegant look, which would make the perfect gift for any seasonal and special occasion. Stone Shape: Round. Stone Size: 3mm. Stone Size: 2.5mm. This set consists of a necklace and earrings. Earrings with Necklace. Atlas Charm. Chain length = 18” 45.72cm. The Set has a plain, clean and elegant look, which would make the perfect gift for any seasonal and special occasion. Each earring weighs 0.7g. Diamond Information Diamond Information. Stone Shape/Cut: Round. Stone Shape: Marquise. Stone Size: 5x2.50mm. Stone Shape/Cut: Marquise. Carat Weight: 0.32ct. The bracelet is set in lush 18 carat yellow gold. There is a hallmark on the bracelet showing '750' for 18 carat yellow gold. The length of the bracelet is 7" approx. The width of the bracelet is 8.9 mm approx. Stone Shape: Pear. Earring Information. Necklace Information. Birthstone: May | Zodiac: Cancer | Wedding Anniversaries: 20th & 35th. Country of Origin: Brazil. Beautiful Jewellery At Exceptional Prices. Sterling silver cat pendant. FREE silver-plated ball stud earrings. Gem Colour: green. Main Gem Size. A classic style oval stud earring and necklace set, crafted from 9ct yellow gold with a polished finish. Earring Information. Stone Shape: Oval. Necklace Information. Natural/Created: Natural Mined Stone. Complete with a 18" / 46cm sterling silver chain. VALENTINES PRICE CRASH £25.99 FROM £29.99! RING SIZE 6. Color: FOREST GREEN. Stone 2 Type: Genuine Diamond. Stone Type: GENUINE DIAMOND. Stone Information. ALL OUR GEMS ARE NATURAL AND GENUINE UNLESS OTHERWISE STATED. Stone Shape: Oval. Diamond Information Stone Shape: Round. Carat Weight: 0.33ct. Birthstone: April | Zodiac: Aries | Wedding Anniversaries: 10th, 60th & 75th. Stone Size: 4x3mm. 0.53ct Emerald and 0.20ct Diamond, 18ct Yellow Gold Jewellery Suite - Vintage Circa 1990. We also have a range of other services including ring engraving, jewellery cleaning, gold and silver restoration and valuation services. Hallmarking : Pendant, Earrings & Chain, Fully Hallmarked '375'. Stone Shape: Round. Stone Shape: Pear. Birthstone: May | Zodiac: Cancer | Wedding Anniversaries: 20th & 35th. 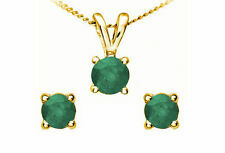 Emerald Earring And Pendant Set - Brand New. Comes with silver chain. 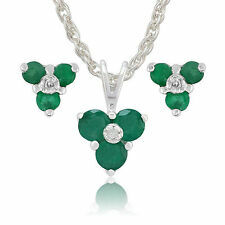 Brand new Emerald pendant and earrings set. Originally purchased from Dubai. Diamond Information Shape/Cut: Round. Stone Shape/Cut: Round Facet. Stone Shape/Cut: Round. Carat Weight: 0.23ct. Number of Stones: 6. Birthstone: April | Zodiac: Aries | Wedding Anniversaries: 10th,60th & 75th. Diamond Information Shape/Cut: Round. Diamond Information. Stone Shape/Cut: Round. Carat Weight: 0.42ct. Number of Stones: 1. Stone Size: 6x4mm. Stone Shape/Cut: Oval.